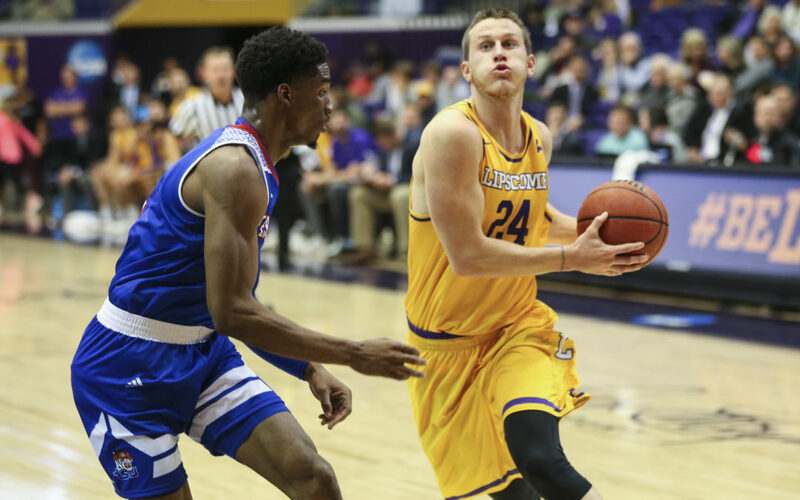 MURFREESBORO, Tenn. — Garrison Mathews continues to highlight the Lipscomb men’s basketball team’s success, and Saturday’s game was no exception. The senior guard led Lipscomb with 29 points to help the Bisons (6-1) defeat the Middle Tennessee Blue Raiders (3-5) by a score of 84-74 at Murphy Center. Although the Bisons finished the first half down by one point, they stayed a step ahead in the second half, maintaining a double-digit lead numerous times. “When you have all the offensive talent that we have, they can’t just focus on me, they’re going to focus on everybody else on the floor,” Mathews said. Senior forward Eli Pepper put up the best defensive performance for the Bisons, grabbing eight defensive rebounds, four steals and two blocks. For the Blue Raiders, redshirt junior guard Antonio Green lit up the scoreboard, shooting 10-of-23 to finish with 30 points. Junior forward Reggie Scurry grabbed a team-leading six rebounds for Middle Tennessee. But the Blue Raiders out-fouled Lipscomb 24-18 and had just over half the amount of assists the Bisons did. Both teams went back-and-forth throughout the first half. Neither team managed a lead of more than six points, and Middle Tennessee held a halftime lead of 38-37. Lipscomb took over the beginning of the second half with a 9-2 run, including four points from Pepper. The Blue Raiders mitigated Lipscomb’s hot start with a 6-0 run to tie the game at 46 with 16:09 left. Up 49-48 after a Middle Tennessee field goal, the Bisons slowly started pulling away. Five points from senior forward Karl Gamble were not enough for Middle Tennessee as it watched a one-point deficit turn into a 62-53 lead for the Bisons. Later, redshirt freshman center Ahsan Asadullah gave Lipscomb its largest lead on a layup with 8:10 left. Lipscomb led 70-57. Lipscomb put an exclamation point on its defensive performance by preventing Middle Tennessee from scoring from the 4:23 to the 0:35 mark. The Bisons play next at Belmont for the second and final 2018 installment of the Battle of the Boulevard. Tipoff is scheduled for 7 p.m. at the Curb Event Center.